It has been a good summer for Swainson’s Hawks. What I mean by that is that I have had the opportunity to observe many more of them this year than I have in the past. 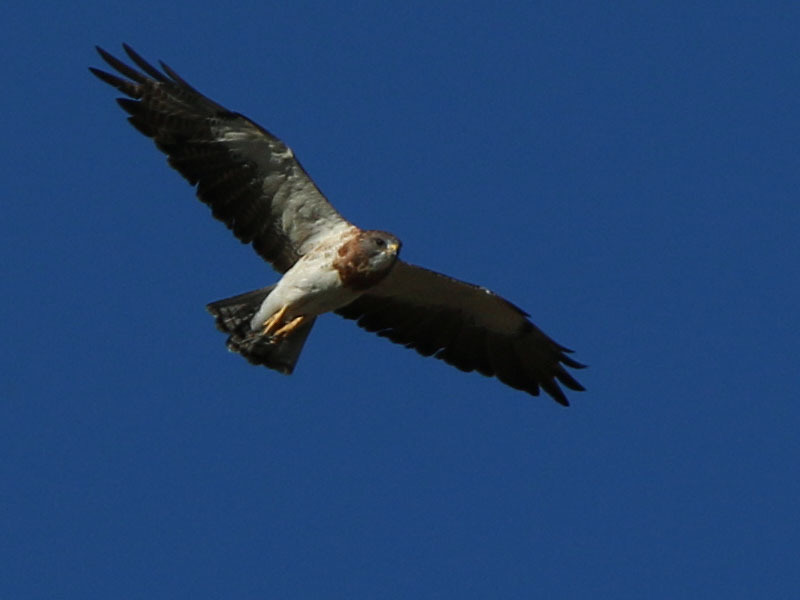 Until this summer, every time I have observed Swainson’s Hawks they have been on the wing and high in the sky. I’ve never really ever had a good look at one. For some reason I am noticing them with far more frequency this summer. I’ve even managed to to get a couple of decent photographs to share. Now, whether this change represents an actual phenomenon or just a shift in my luck, I am not quite sure. Spending years waiting to see a particular species of wildlife can create an air of mystery and intrigue about the animal in question. I feel that way to a degree about the Swainson’s Hawk, and they have become fascinating to me. Swainson’s Hawks spend their winters in South America. They migrate to locations in North America to spend the summer and to breed. It is thought that these hawks migrate further than any other western hemisphere raptor. In fact, I got news just this morning that a large kettle of Swainson’s Hawks was observed flying high over Fort Worth heading south toward their wintering grounds. 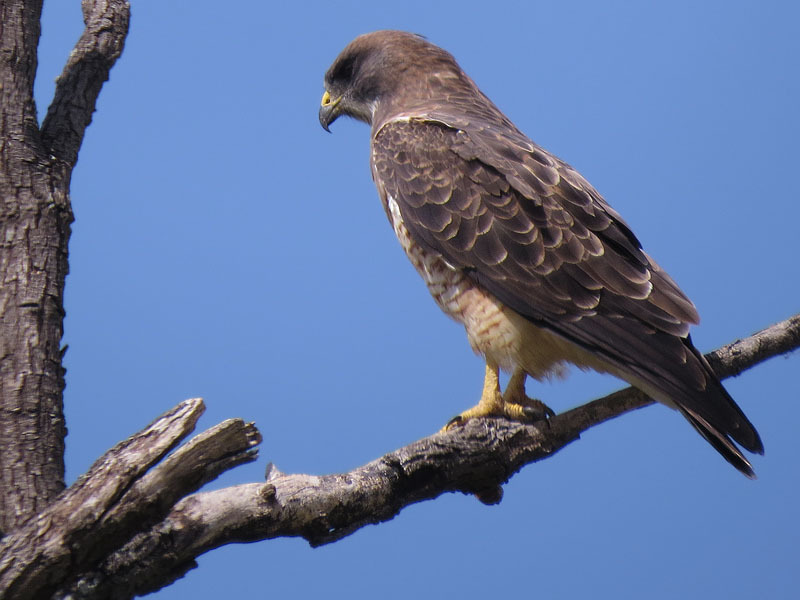 In size, form, and function Swainson’s Hawks are very similar to our more common hawks. They differ mainly in habit. Year-round resident hawks like the Red-tailed Hawks or the Red-shouldered Hawk are not difficult to observe in the DFW Metroplex. Red-tailed Hawks, and to a lesser degree, Red-shouldered Hawks are well adapted to urban living. Swainson’s Hawks do not seem to be. 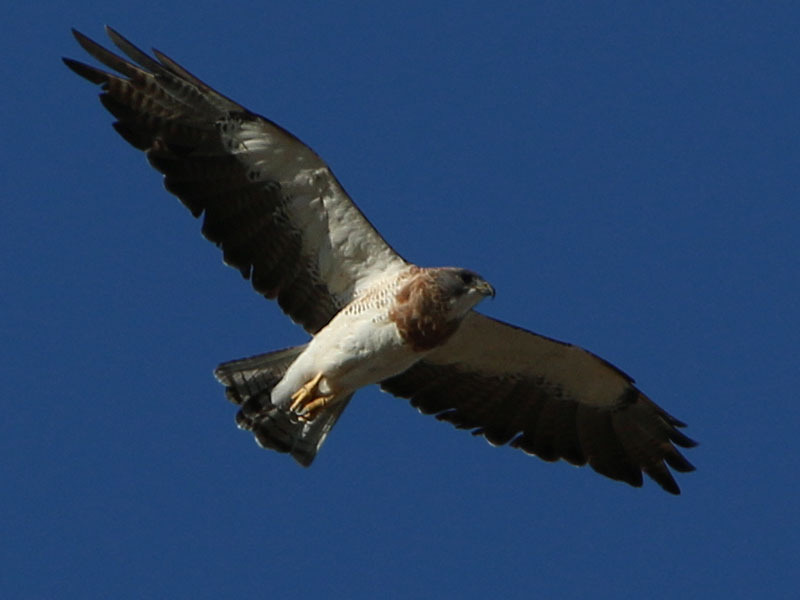 The diet of the Swainson’s Hawks also is different from our other native buteos. Swainson’s hawks are thought to be almost exclusively insectivorous when not caring for young—evidently preferring large grasshoppers. When a nest full of hungry mouths demands it, these hawks will switch over to hunting vertebrates like small mammals and reptiles. I observed this fine looking Swainson’s Hawk perched on a tree next to an area where construction had recently begun on a new subdivision. The woods here follow a creek and were relatively dense for an urbanized area in North Texas. This particular tree was one of the tallest along the perimeter and gave the hawk a nice view of the construction area. A perched Swainson’s Hawk. Photograph by Nick Jackson. Also in the general area was and abundance of late summer Scissor-tailed Flycatchers and a few Brown-headed Cowbirds—including one with a slightly odd coloration. 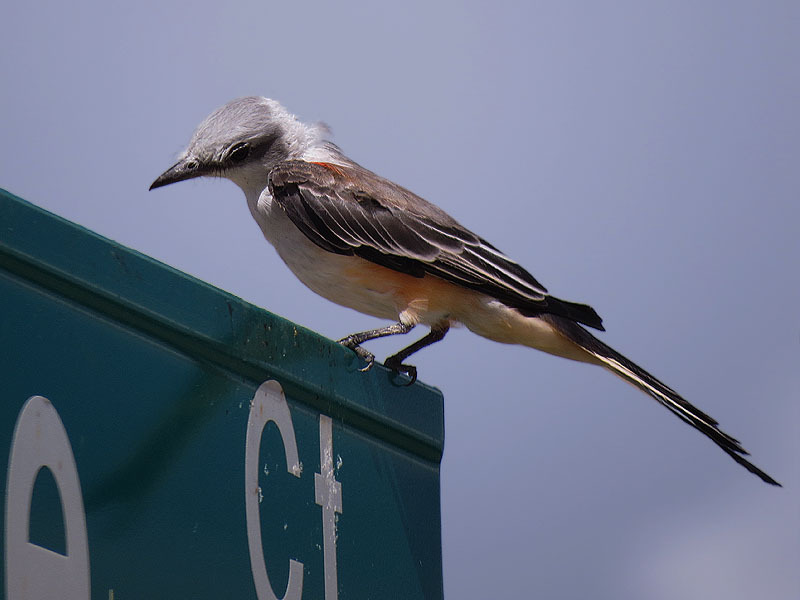 A Scissor-tailed Flycatcher after molting the longest of his namesake feathers. 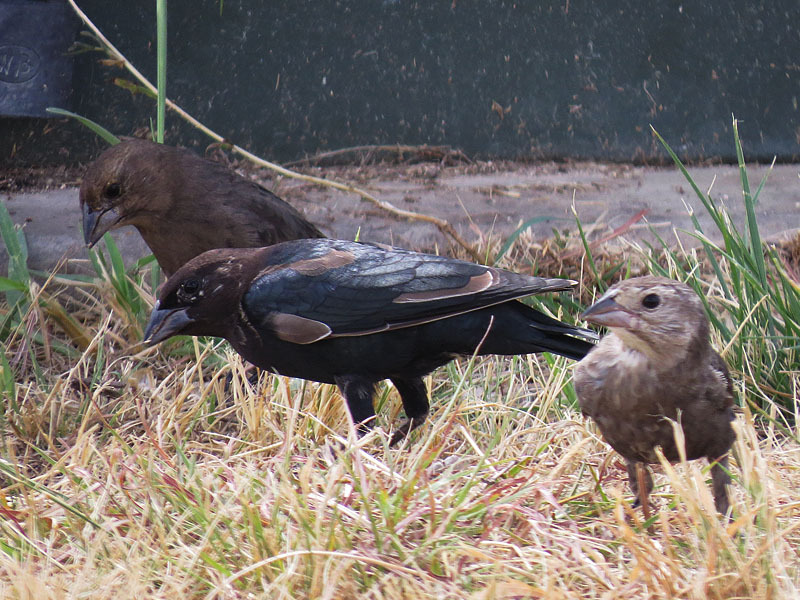 An oddly colored male cowbird with a female and a juvenile. 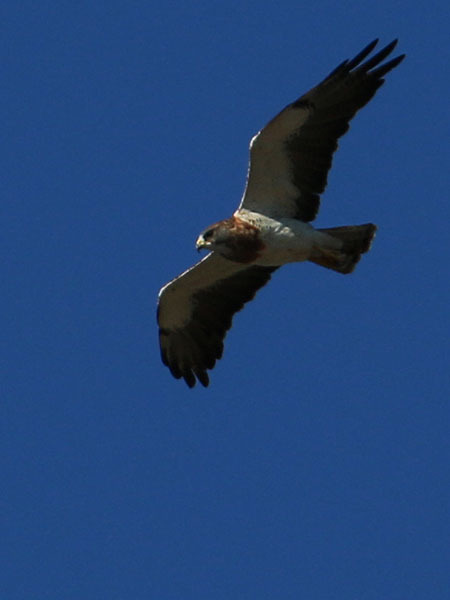 The Swainson’s Hawk below was observed hover hunting over the Lewisville Lake Dam just a few days ago. 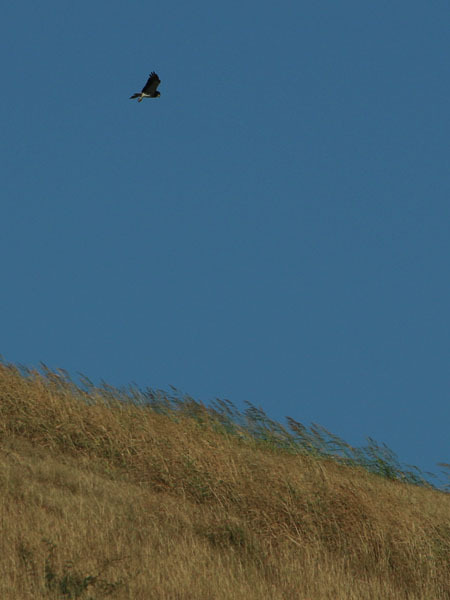 A steady breeze was blowing in from the south creating an updraft at the dam that the hawk was able to use to hang almost motionlessly above a fixed point on the ground. It is my guess that grasshoppers were on the menu for this Swainson’s Hawk. A Swainson’s Hawk hover hunting over Lewisville Lake Dam. The Swainson’s Hawk was focused on finding prey. Hover hunting and looking for grasshoppers. A few other birds of note were present and nearby while I was photographing this Swainson’s Hawk. A much smaller American Kestrel—a Blue Jay-sized falcon—was also hunting grasshoppers along the dam. 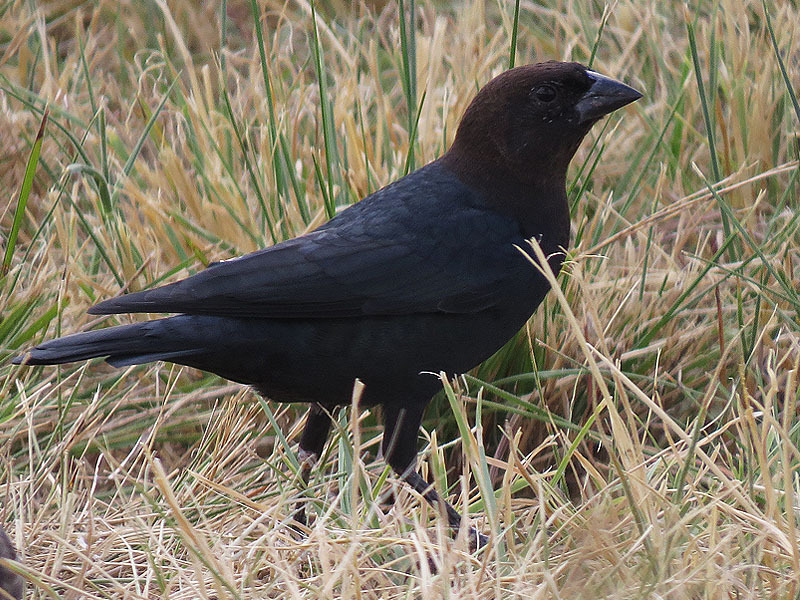 He was having much luck and was observed feeding on the wing. 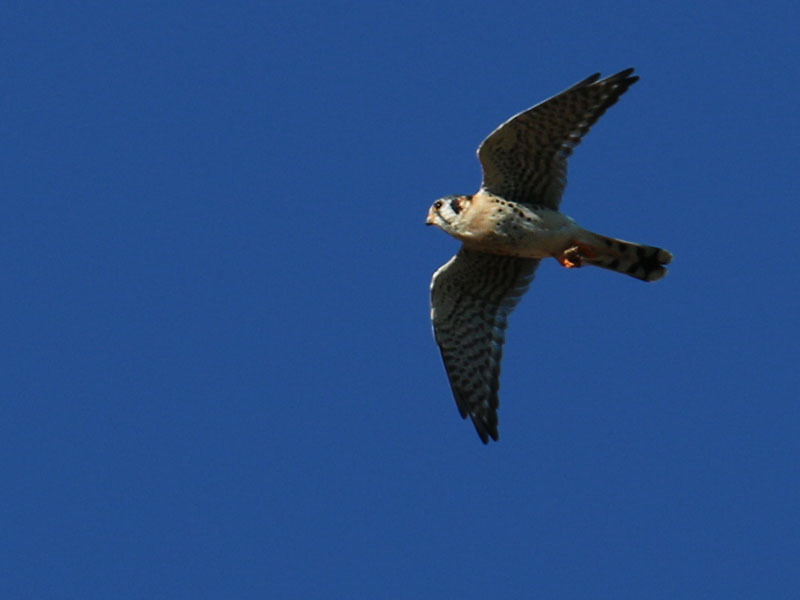 A much smaller American Kestrel was also hunting grasshoppers. 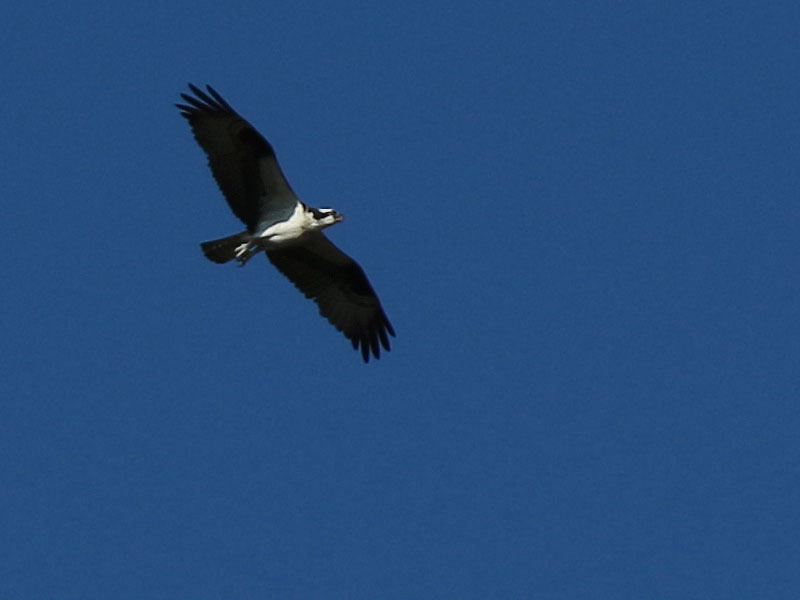 Also seen flying overhead was a very nice looking Osprey. This big, fish-eating raptor was definitely NOT hunting grasshoppers! 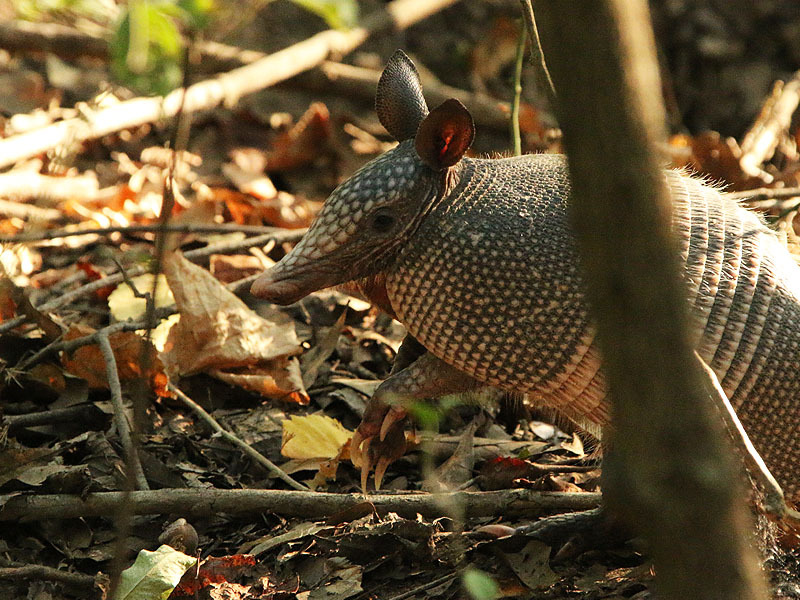 And finally, there was this little guy—a juvenile Nine-banded Armadillo. He was keeping an eye on me from the roadside vegetation when he was not busy rooting in the detritus for his next meal. A grasshopper probably would have served just fine for dinner in his case as well. An Armadillo keeping an eye on me from the roadside vegetation. 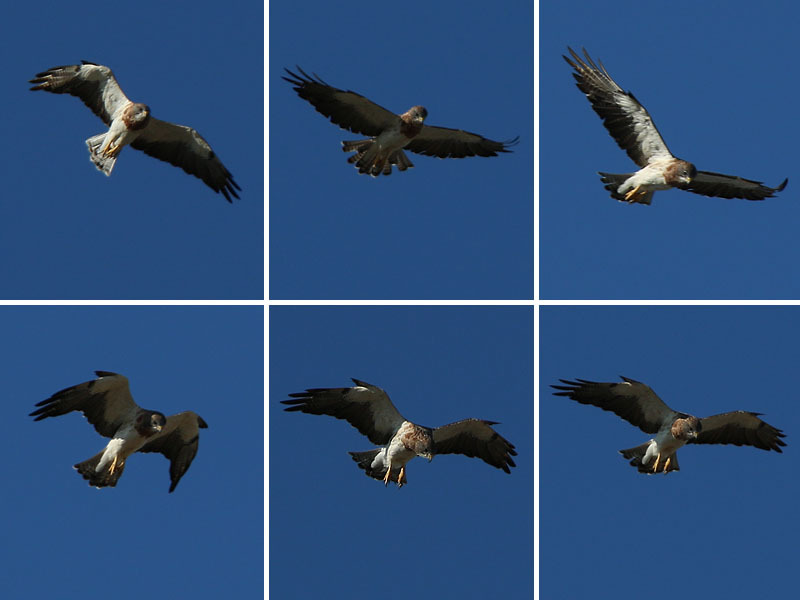 Awesome Swainson’s Hawk pictures!! 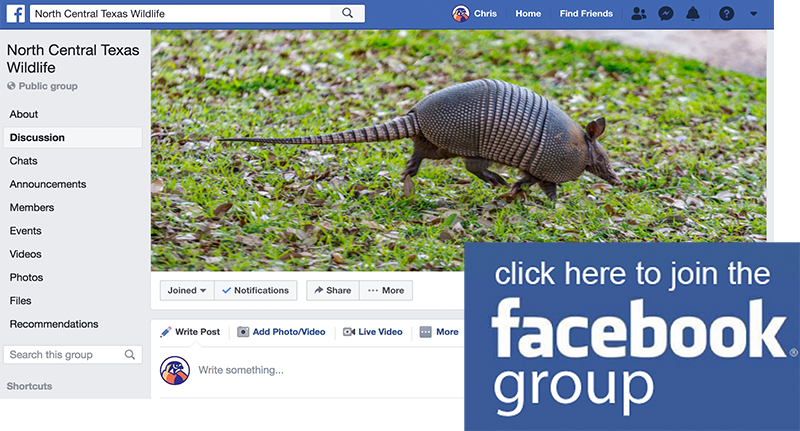 I also love the Armadillo picture, one of my favorite Texas critters. This one seems unusually curious and unafraid.